I will create a new task #1 for project Management. I copy the start date cell of the project summary task (Task #0), right click on the cell and select Copy Cell. Then the idea is to paste this cell as a link on the Project Management task start date. Right click on the cell and click Paste Special. 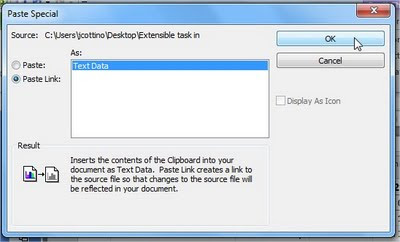 On the paste special window, select Paste Link and Text Data, and then click on OK. Note that the bottom right corner of the cell contains this grey triangle which means that the cell is linked to something. Repeat this for the End Date. If we now open the Task Inspector for this task, we see that there is a Finish No Earlier Than constraint type. Let’s modify another task, for example let’s put 5 days for task 1’s duration. Note that the Project Management task has been extended until the new project end date. I learnt something from this - thank you. Ive been doing IT project management a long time and I didn't know this ! Thanks Gary for the note, appreciate it. Hammocks work nicely UNTIL... you try to share the file with someone else. Then you discover that all the links are STORED as external file references to your local drive. How MS figured out this would be useful I don't know. Hi Jeremy, my name is Lindsey and write from Brazil. I would like to ask a question about hammock. I made a schedule using hammock, created activities as you teach, but when I update the schedule or change the time of the activities, the hammock activity takes too long to upgrade and sometimes hangs. Is there some setting I have to do to get faster?